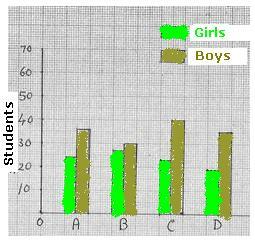 This data can be pictorially represented as shown in the adjoining figure (Bar chart). The vertical line has markings in steps of 5 runs (from 0 to 30). The names of the area are marked on the horizontal line and each area is represented by a bar. The height(length) of the bar is proportional to runs scored. Width of the bars is same. Let us represent the above data in a different format as shown in the adjoining figure called Pie Chart. Here the areas are represented by different colors, starting with Midwicket area, the area in which highest runs were scored (28%). In this type of chart, runs are represented by the size of the sector converted to percentage. Higher the percentage, larger will be the size of the sector (converted to percentages). If you compare the above two types of pictorial representations for the same data (Bar chart and Pie chart), don’t you think that Pie Chart is more appropriate as compared to Bar chart in this example. The reason is Pie chart gives us a complete picture of scoring pattern and sum of percentages of all sectors = 100%. 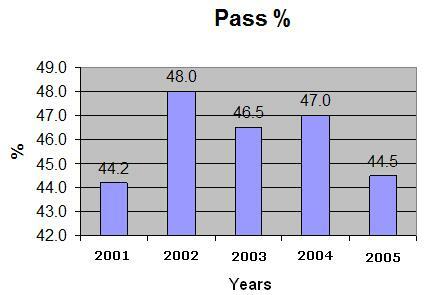 In the adjoining figure, we have marked pass % from 42 and not from 0. 5.2. 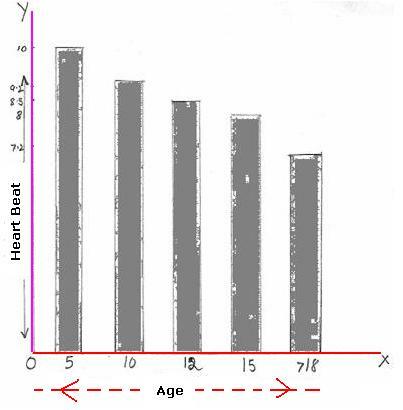 Example 3: Draw a suitable chart to represent the following data about heartbeat of a human being. We notice that heartbeats can not be expressed as % and hence Pie chart can not be drawn for this set of data. We have to represent this data as Bar chart. OX will be the line which will represent Ages and OY will be the line which will represent heartbeats. Step 3. Since heartbeats are between72 and 100, we use the scale 1cm = 10 heartbeats. These will be the heights of bars. Step 4. On line OX, mark ‘5’ at approximately 1.5cm away from O (this will represent the age group 5). Step 5. Construct a bar of height 10cm (=100 heartbeats) and width of 1cm above ‘5’. This bar will represent the age group 5. Step 6. Mark ‘10’ at approximately 1.5cm away from the above bar (this will represent the age group 10). Step 7. Construct a bar of height 9cm(=90 heartbeats) and width of 1cm above ‘10’. This bar will represent the age group 10. 5.2 Example 4: Draw a chart for viewer ship (viewing pattern) of different channels, among 250 students, which is given below. Since students belonging to each category can be expressed as % of the total (250), we need to draw a Pie Chart. Step 1 : Calculate the size of sector proportionate to the number of students for each of the above 4 categories. Note : Angle at center of circle is 3600. We multiplied each of the student count by 360 and divided them by total number of students (250) to get the proportionate size of the sector. Step3. Mark the above angles at the center of the circle and draw sectors correspondingly. Step4. Shade them suitably so as to distinguish each of the sectors and write names of the channel in the appropriate sector. Represent the above data in a suitable format. In such a case since charts are different, it would not be possible to read and compare data easily. 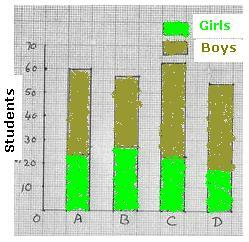 If we represent data for girls and boys side by side as in figure on the left hand side it becomes easy for analysis. As an alternative, what if we represent data in the same bar one above the other, like in the figure on the right hand side? Bar chart is a method of representation of data in bars of equal width. However length of the bar is proportional to its figure (number). 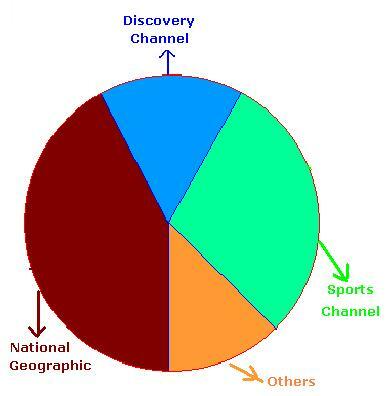 Pie chart is a method of representation of data in terms of sectors of a circle. The size of sector is proportional to its figure (number).